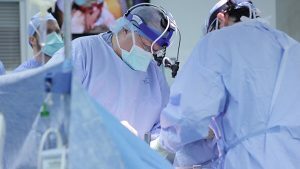 After a patient is found to have a gastrointestinal stromal tumor (GIST), David Rattner, MD performs a laparoscopic resection, carefully avoiding the nerves of Latarjet. He then confirms the success of the procedure with an upper GI endoscopy. A patient presents with dysphagia and is found to have a locally advanced distal esophageal adenocarcinoma. She is treated with neoadjuvant chemoradiotherapy and Christopher R. Morse MD performs a minimally invasive Ivor Lewis esophagectomy. JoMI has just published a new video article by Dr. Matthew Provencher, Chief of Sports Medicine at the Massachusetts General Hospital and Medical Director of the New England Patriots. The video article covers in detail a procedure to resurface the cartilage of the knee for a patient with a condition called Osteochondritis Dissecans (OCD).